Universal credit is the biggest change to our social security system in over sixty years. It will eventually replace many of the current benefits and tax credits for people of working age. With the national roll-out complete, increasing numbers of people can claim universal credit including families with children, those with health conditions and those in work. We can provide our courses in-house at your premises or a venue to suit you, to meet the training needs of your organisation. This can be more cost-effective, saving on time, travel and accommodation. We provide the expert tutor and all the training materials. We can tailor courses for you. Get in touch to find out more about how we can help you train staff to support low income households. To make an enquiry and to get a quote please email lmurphy@cpagscotland.org.uk. Our free universal credit elearning course has been designed for frontline workers who do not work in welfare rights but want to get to grips with important changes in the benefits system. Through interactive quizzes and activities you will look at how universal credit works. You can create an elearning account for free here. Our courses take an average one hour to complete. Once you have completed the course and submitted your evaluation, you can then print off your certificate. A new edition of CPAG’s popular easy to follow guide is out now. 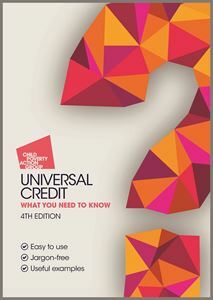 It is an essential resource for advisers who need to know how and when universal credit will affect their clients, and for those currently claiming the benefit themselves. It is filled with clear advice and lots of useful examples. It covers all recent developments, including the “two-child limit” and other legislative updates. The guide is £15 and £12.75 for CAB customers and CPAG members. You can order your copy online or by contacting CPAG book orders on: 020 7812 5236 with your credit card details or email bookorders@cpag.org.uk. A basic factsheet on universal credit is available here. We have a wide range of factsheets, which include several on different aspects of universal credit and welfare reform which you can view here.